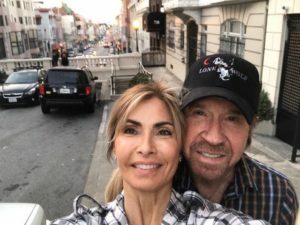 Star of television and the silver screen Chuck Norris and his wife Gena are suing seven pharmaceutical and medical diagnostic companies along with their subsidiaries for failing to warn Gena or her healthcare providers of the risk of gadolinium. Gadolinium Deposition Disease (GDD) occurs in patients that have received injections containing gadolinium-based contrast agents that assist medical professionals in reviewing MRI readings. Some patients that have received the gadolinium have reportedly developed persistent symptoms like headaches, bone and joint pain and clouded mental activity. Chuck and his wife Gena are seeking over $10 million from McKesson Corporation, Bracco Diagnostics as well as others. Gena claims that she suffered from gadolinium poisoning following a series of MRI scans that she received in 2012 to examine her rheumatoid arthritis. Gena claims that she had normal kidney function before the MRI scans, but she was soon hospitalized several times following the treatments due to debilitating bouts of pain and burning throughout her body that would follow the MRIs. Gena is certain that gadolinium poisoning was to blame for her illness and the Norris family is claiming that they have spent over $2 million in GDD treatments over the span of the last five years. The Norrises are seeking damages for fraudulent misrepresentation, fraud by concealment, negligence, and loss of consortium. You can read the full lawsuit by CLICKING HERE.